On December 22, a China-Myanmar joint venture developing a copper mine in central Myanmar announced that it had gained “broad community support” to continue the controversial project and that it would be expanding the area covered by the mine. The day ended with 56-year old Daw Khin Win shot dead and two other villagers injured as police opened fire with live ammunition on local protesters. The bloody day in December was only the latest violent incident to mar the Letpadaung project, part of a larger mining complex located in Monywa, Sagaing Region. People living around the massive Letpadaung mine have long protested against forced evictions, occupation of farmland and the environmental damage wrought by the project. In 2012, white phosphorus incendiary munitions were fired at protesters, inflicting injuries including severe burns on more than 100 people including Buddhist monks who were demonstrating against the project. A comprehensive report released Tuesday by London-based campaign group Amnesty International — outlining a litany of violations linked to the project — adds to a long list of accusations that rights abuses continue under the nominally civilian government that came to power in Myanmar in 2011. But the report is also potentially damaging to the government’s efforts to show that extractive projects in the country can be conducted responsibly. The report, titled Open for Business? Corporate Crime and Abuses at Myanmar Copper Mine, runs to more than 200 pages in length and “exposes how Myanmar offers the perfect storm of a rich natural resource base and a weak regulatory framework that has allowed foreign and Myanmar companies to engage in and profit from serious human rights abuses,” it says. The project dates back to the 1990s, when Canadian firm Ivanhoe Mines (now known as Turquoise Hill Resources) entered a joint venture with the Myanmar government to develop vast copper deposits beneath the earth. The mine is now owned jointly by the Myanmar government, a Myanmar military-owned company and Wanbao Mining, part of Norinco, a Chinese state-owned conglomerate that manufactures weapons. The report decries a lack of transparency at every stage, from the lack of public consultation to a failure to disclose environmental risks to the “opaque sale of assets” that has not been explained by the entities involved. It warns that breaches of business rules and regulations have been tolerated by authorities. “When business operations breach law with impunity it encourages further illegal conduct and human rights abuses,” the report says. “It is essential that governments ensure transparency and accountability to prevent a cycle of corporate crimes and human rights abuses”. The publication of the report comes as Myanmar is hoping to be accepted to the Extractive Industries Transparency Initiative (EITI), an international scheme that seeks to ensure deals done to extract oil, gas or mineral resources are open to scrutiny. “We hope the findings of the report are taken up by the EITI Board and that the government of Myanmar is asked to demonstrate its commitment to transparency by making details of the Monywa project sale and other information around contracts and company ownership public,” said lead author Meghna Abraham, deputy director of global thematic issues at Amnesty International. Countries that are members of EITI are seen as a safer bet for reputation-conscious international investors, and as Myanmar welcomes foreign competition, damaging accusations of rights abuses linked to investment could be a major barrier to the county reaping greater revenues from its natural riches. Investment is ramping up in the offshore oil and gas sector, with new deals being signed for global firms like Royal Dutch Shell to explore for hydrocarbons off the coast. Onshore, however, many of Myanmar’s natural resources — which include gold and other metals, jade, rubies and vast tracts of untouched forests — are found in areas where the majority of the population belong to ethnic minorities. In northern Myanmar’s Kachin state, resources are seen as a driver of the ongoing violence between ethnic rebels and the government, which has flared up in recent months. Late last year, companies — whose identities are not released publicly — resumed using large-scale machinery to mine jade in Hpakant Township after a three-year hiatus. But recent clashes in the area, likely fueled by the jade trade, have forced many mines to close once again. Following Daw Khin Win’s shooting at the Letpadaung mine, a statement issued by the Myanmar Alliance for Transparency and Accountability (MATA), said the incident “hinders implementation of the EITI mechanism in Myanmar”. The group, which was set up by local civil society organizations to manage their involvement in the EITI application process, said it would raise concerns about the government’s handling of the Letpadaung project. “We recommend that when the EITI board considers Myanmar’s application to EITI they take into account the due diligence, accountability and transparency of the Government of Myanmar in handling this case,” the statement said. And MATA’s voice is important. The EITI application calls for the country to create an “enabling environment” for civil society involvement in the process, and groups are able to cry foul if their concerns are not listened to, potentially derailing the application. MATA technical advisor and steering committee member Wong Aung said that Letpadaung was just one case of activists facing difficulties when they challenge mining and other projects across Myanmar. Many have been prevented by local authorities from holding educational forums about EITI or other resource issues, he said. “There are so many problems, but they are happening outside of Yangon and Naypyidaw. To hold training or workshops in the remote areas, we need permission,” said Wong Aung, also known for his work as director of the Shwe Gas Movement. Activists have been jailed under laws limiting the right to protest or using trespassing laws, with the number of people in Myanmar’s jails considered political prisoners swelling over the past year. Wong Aung warned that the international community could be “ambushed” by a government that may be taking part in EITI only to clean up its image and attract more investment, while continuing to stifle efforts toward accountability. 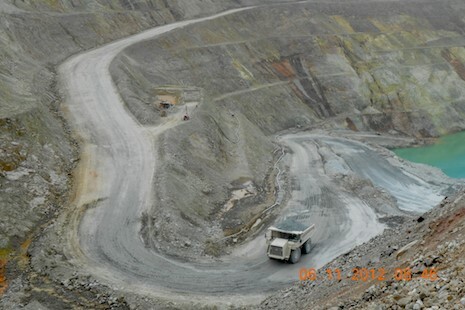 As for transparency, the Myanmar government had shared the details of some large-scale mining projects, Wong Aung said. But, despite encouragement to adopt a transparent approach ahead of EITI membership as a show of good faith, much information is still not available. Win Myo Thu, director of local environmental group EcoDev, agreed that confronting vested interests would be the real test of the Myanmar government’s commitment to transparency. Global Witness, a UK-based watchdog that is a member of EITI’s international board, is pushing for Myanmar’s government to take civil society participation in the EITI process seriously. “If EITI delivers on its promise of prising open Myanmar’s extractive industries it could begin to redress the power imbalance between the elite that is currently benefiting and the rest of the population,” said Mike Davis, a senior advisor at Global Witness. “But even in the best case scenario, EITI will not provide a silver bullet solution to the many injustices and abuses that have characterized Myanmar’s oil gas and mining industries for so long. It is a potential catalyst for a change and a milestone on the long road to genuine accountability,” said Davis. “However those government officials, international donors and CSOs [civil society organizations] involved all risk generating or experiencing severe disappointment if they treat Myanmar’s EITI process as an end in itself,” he added. Important to Myanmar’s success in applying to EITI is a report to be submitted to EITI next year by a multi-stakeholder panel comprised of NGOs and the government. Win Myo Thu, a member of the panel, warned that civil society representatives would not baulk at using its position in the EITI process to ensure the government makes improvements. “If we find there is so much injustice, if we feel we are manipulated by the government, we will stop EITI,” he said. *This article first appeared on ucanews.com on 10 February 2015.